Mondrian was a member of the Dutch De Stijl movement from its inception in 1917. By the early 1920s, in line with De Stijl practice, he restricted his compositions to predominantly off-white grounds divided by black horizontal and vertical lines that often framed subsidiary blocks of individual primary colors. Tableau I (1922), a representative example of this period, demonstrates the artist's rejection of mimesis, which he considered a reprehensibly deceptive imitation of reality. In 1918 Mondrian created his first "losangique" paintings, such as the later Composition No. 1: Lozenge with Four Lines (1930), by tilting a square canvas 45 degrees. Most of these diamond-shaped works were created in 1925 and 1926 following his break with the De Stijl group over Theo van Doesburg's introduction of the diagonal. Mondrian felt that in so doing van Doesburg had betrayed the movement's fundamental principles, thus forfeiting the static immutability achieved through stable verticals and horizontals. Mondrian asserted, however, that his own rotated canvases maintained the desired equilibrium of the grid, while the 45-degree turn allowed for longer lines. Art historian Rosalind Krauss identifies the grid as "a structure that has remained emblematic of the modernist ambition." She notes that of these paintings by Mondrian, whose work has become synonymous with the grid, two signal opposing generative tendencies. Composition No. 1: Lozenge with Four Lines, in which the lines intersect just beyond the picture plane (suggesting that the work is taken from a larger whole), exemplifies a centrifugal disposition of the grid; Tableau I, whose lines stop short of the picture's edges (implying that it is a self-contained unit), evinces a centripetal tendency. 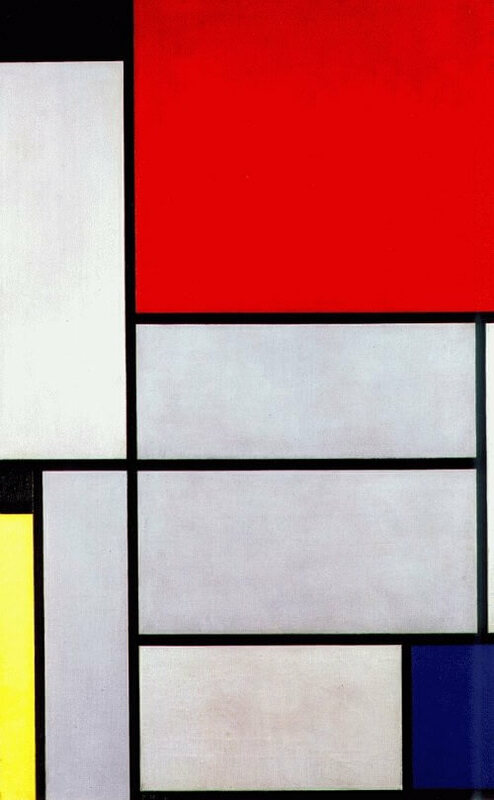 Krauss argues that these dual and conflicting readings of the grid embody the central conflict of Mondrian's - and indeed of modernism's - ambition: to represent properties of materials or perception while also responding to a higher, spiritual call. "The grid's mythic power," Krauss asserts, "is that it makes us able to think we are dealing with materialism (or sometimes science, or logic) while at the same time it provides us with a release into belief (or illusion, or fiction)."